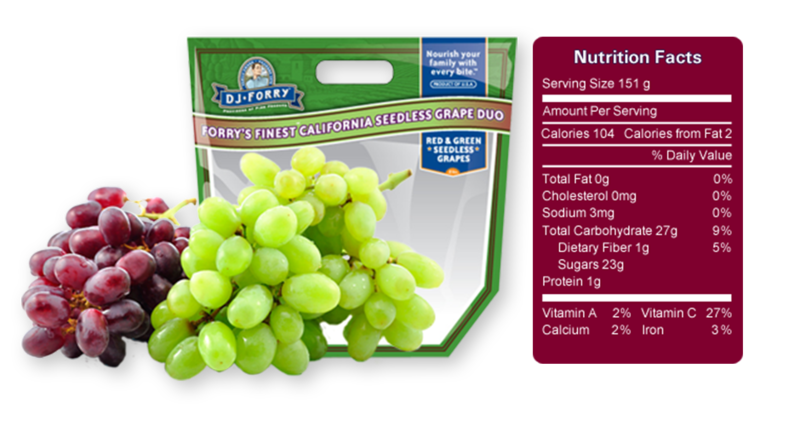 Whatever your favorite—red, black, or green—the DJ Forry Company has worked to bring the best Central Valley California Grapes to your table for over 40 years. That’s why DJ Forry works with farmers that bring a rich tradition of growing not only some of the best-tasting grapes from California, but also in utilizing the latest, most up to date farming and harvesting methods to ensure only the best and safest grapes reach your table. Plus, we make the trip home easy with our new Forry’s Finest Grab N Go Pouch. How to Choose Grapes. First you should look for our new grab n go bag in the Forry’s Finest label. Second, look for the “bloom.” Grapes grow with a delicate white substance called “bloom.” Bloom is Mother Nature’s way of protecting grapes. When you find grapes in your local market that still have their bloom, you know they are fresh. In addition to the bloom, look for grapes that are plump, not wrinkled, and always look for fresh green stems. If you are a fan of green grapes, don’t shy away from a yellow coloring—what we call “amber.” That slight yellow color is just a sign of sugar. Keep your grapes refrigerated when possible. Grapes will last longer when kept chilled. For the best results, DJ Forry recommends that you store grapes in their original container. You should refrain from rinsing grapes until ready to use. Always remember that grapes will absorb odors, so keep containers closed. Red, black, or green grapes are packed with essential nutrients like vitamin A, vitamin C, vitamin B6, vitamin B, and folate. Grapes of all colors are also rich in manganese and potassium which may aid in reducing the risk of hypertension. Other minerals found in grapes are copper, zinc, calcium, phosphorous, iron and selenium. Quite often, high antioxidant levels in grapes are associated with red wine or red grapes. However, fresh grapes of all varieties have high levels of antioxidants. Green or white grapes contain high levels of antioxidants called catechins, a flavonoid tannin that has anti-inflammatory and anti-infective properties. Red grapes are high in polyphenolic antioxidants called anthocynins that have significant anti-inflammatory and anti-infective properties which may promote heart health. Resveratrol found in grapes has been shown to reduce risk of stroke and may help fight against lung cancer. Saponin which is more prevalent in red grapes may help to lower cholesterol. The antioxidant compound in grapes called pterostilbene is known for both cancer and cholesterol fighting properties.